The hydrogen content of aviation fuel is an important parameter as it determines the combustion properties of the fuel. Traditional methods such as smoke point, smoke volatility index and luminometer number are tedious, time-consuming and usually require skilled analysts. Nuclear Magnetic Resonance (NMR) offers the opportunity to monitor the hydrogen content of fuels rapidly, non-destructively and with minimal sample preparation. For 20 years, Oxford Instruments Magnetic Resonance led the way with the Oxford Instruments Magnetic Resonance 4000 Continuous Wave (CW) NMR Analyser, an American Society for Testing and Materials (ASTM) compliant instrument, for rapid and efficient measurement of hydrogen content in fuels. Since CW instruments are no longer commercially available the previous ASTM standard method has been updated for the use of Pulsed NMR. In this method, the fuel samples are carefully transferred into glass tubes using a pipette, weighed and conditioned at 35°C or 40°C for 30 minutes prior to NMR analysis. Although this method was designed for aviation fuel, it can be adapted to suit distillates covered by other methods (e.g. D3701-01 and D4808-01) as well as those which are more volatile or have a high wax content. 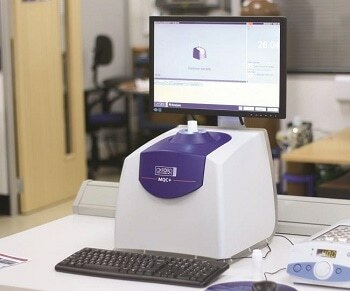 The instrument can be calibrated using real samples of known hydrogen content which span the range of interest; a list of chemicals are recommended in the standard method. In this example, the calibration was produced by using known masses of dodecane, diethyl malonate, cyclohexyl acetate, ethyl heptanoate, octyl acetate, ethyl caprate, 2-nonanone and pentadecane giving a correlation coefficient of 1.00 and standard deviation of 0.03. The predicted NMR results from this calibration are compared against the reference values in Table 1. The precision of the experiment was checked by measuring a sample of 2- nonanone (12.756 %wt H) against this calibration curve, the results of which are shown in Table 2. The results show that the method gives accurate and reproducible measurement of hydrogen content in fuels. This information has been sourced, reviewed and adapted from materials provided by Oxford Instruments Magnetic Resonance. For more information on this source, please visit Oxford Instruments Magnetic Resonance.